Waverley - The Last Sea-Going Paddle Steamer in the World Offical Website . Next Branch Meeting Saturday 1st March 2pm at East Cowes Town Hall. Click here for a printable form. The Wessex Branch is proud to represent the area where the Society was originally founded in 1959. It was while sailing on PS Freshwater between Lymington and Yarmouth that Professor Alan Robinson conceived the idea of the PSPS.We welcome Waverley to our area each September, and Balmoral for a short visit in springtime. The branch has a programme of outings in the summer and meetings during the winter season at Bournemouth, Southampton and East Cowes to which all are very welcome. The Paddle Steamer Preservation Society (PSPS) is Britain's longest established, largest and most successful steamship preservation group. A registered charity founded in 1959, we have over 3000 members and through our associated companies we operate the only two working paddle steamers in Great Britain. Without the PSPS there would no longer be the opportunity to sail on a Paddle Steamer in Great Britain. Our Aims i) to preserve paddle steamers in sailing condition ii) to educate the public in the historic significance of paddle steamers in the Nation's maritime heritage. iii) to acquire, preserve and exhibit a collection of equipment and material associated with paddle steamers. Our Ships Flagship of our fleet is Waverley the last sea going paddle steamer in the world. Built in 1947 Waverley was gifted to the Society for just £1 in 1973. As well as operating on her native Clyde each summer she visits other coastal area around the UK including the south coast. Kingswear Castle is Britain's only operational coal-fired paddle steamer. 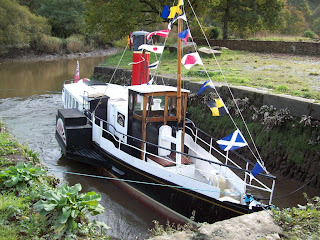 Built in 1924 to sail on the River Dart she was purchased by the society in 1967. From 1985 until 2012 she sailed on the Thames and Medway, in 2013 she returns to the River Dart to offer cruises on her home waters. The society is composed of five branches: Wessex covering the south coast, Bristol Channel, London & Home Counties, Scottish and North of England.